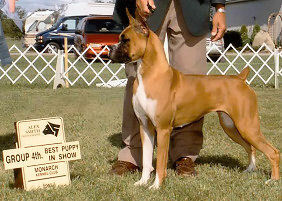 Ch Shadowdale's Limited Edition ex Ch Shadowdale Kaynine's Keepsake. Hips: clear (OVC). / Echo, ECG, Signal Averaged ECG, Blood Pressure, PCV/TS/Biochem Profile & Holter Monitor (1 VPC) by OVC Guelph - 2008 - all normal. 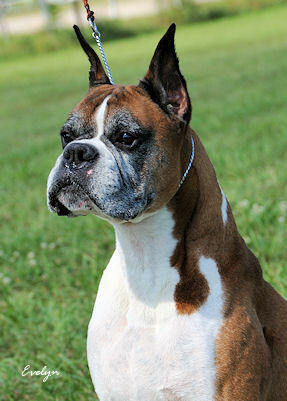 'Dante' - AKA "The Energizer Bunny", a double Harley 'D' grandson. Clowning his way around the ring is his specialty! An extremely happy dog Dante has all the attitude you could ask for and sometimes more.... 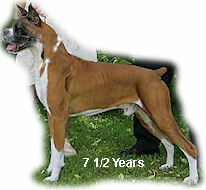 He started showing at just 6 mos of age and has been a consistant winner (with limited showing) since. 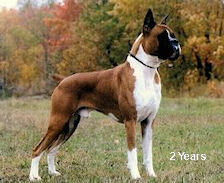 As he matures he just gets better and better. 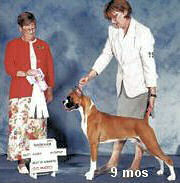 Head shots at 8 years and 8 mos..
Best Puppy in Sweeps (6 to 12 mos) at the BCC Specialty (6 mos & 2days old) -judge Judy Voran. 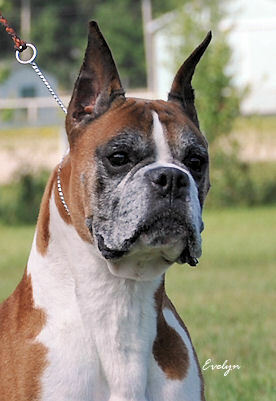 WD, BW, BPB and BPGroup both days at Markham - 5 pts.-judges Audrey Peach & Larry Kereluke. 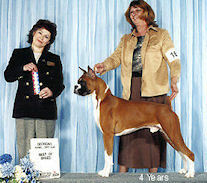 Nippissing WD, BW,BPIB, BEST OF BREED (over specials) & BPGroup. -judge Robert Cole. finishing his Canadian Championship. 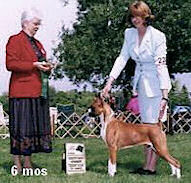 Judge's comment after Best Puppy in show judging: "Thank you for the quality". 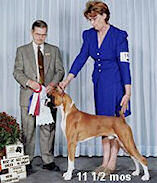 NOBC Specialty - Best Puppy in Sweeps (6 to 12 mos) - breeder judge Dale Scale. 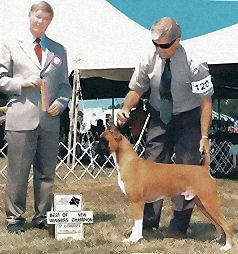 Dante congratulates his son from Uppercut Boxers on finishing his Championship at Beamsville Aug 18, 2006.